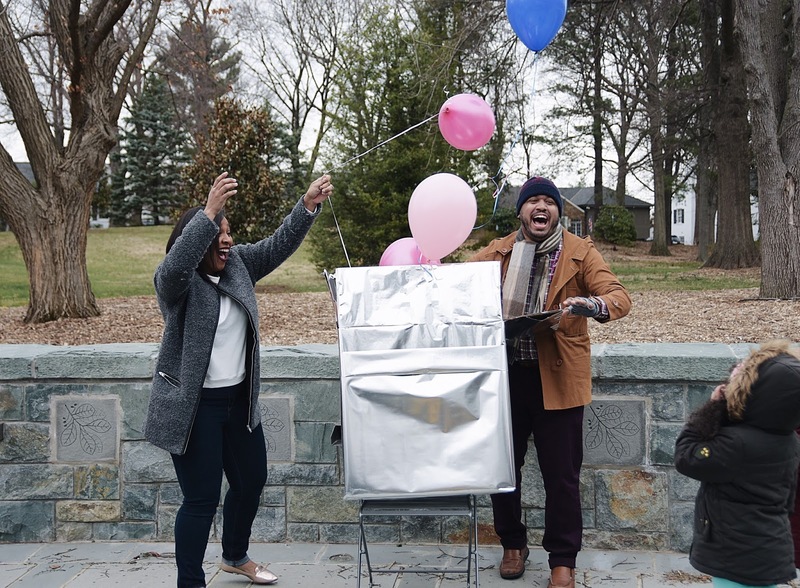 Gender Reveal: It's A Girl! If you follow me on social media then you saw over the weekend I shared the amazing news. WE ARE HAVING A GIRL! Feels so surreal to say that and I honestly can't believe I'm halfway through the pregnancy. It seems so official to me now that we know the gender. Trust me not that it didn't feel real before because this whole journey has been so amazing. The weekend was so amazing as we had family and friends join us for the reveal. My husband and I wanted to be surprised at the same time with our family so the only person who knew was my blogger bestie Marisol. She did such an amazing job at keeping a secret (lol) and putting the whole thing together. 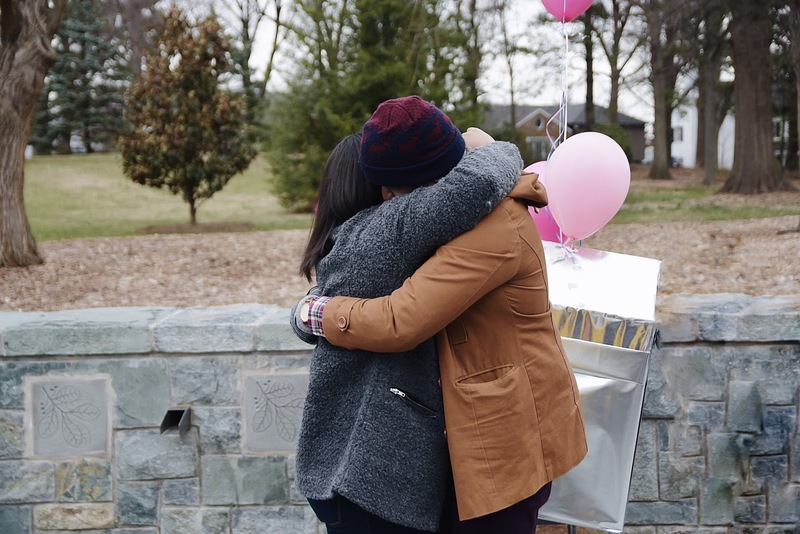 Opening that box and seeing those pink balloons was such an amazing feeling. The first thing that ran through my mind was, I'm going to be the mom of a baby girl. I think that was the moment it just hit me all at once I was going to be a mom. My husband is so excited and can't wait to meet her. He wrote a letter to babygirl and I wanted to share it on here because it seriously made me cry. this such an exciting journey and I happy I can share it with you guys. Over the last four months we have seen pictures of you. We’ve heard your heart beating. We have seen your wave, and your yawn, and hints of you not really being a morning person. It has been both exhilarating and nerve-wracking to see you on a monitor and try to make out what exactly you were. We know now. We know your name, we have had it picked out for a long time, and everyone tells me that you will have me wrapped around your little fingers. I hope that is the case because I am terrified of being your father. I have strived to be a good man, but on the road to being a good man you learn some stuff. We call them lessons, not losses or mistakes, but you have collateral damage sometimes. You make your peace with that as you get older, but when you are told you are about to be a Father to a girl you cannot help but wonder if the things you did will come back and bite you. I have tried my best to be the best me because it was beneficial to me. It is my hope that what I did was enough for you baby girl. You do not have to carry the weight of the world on your shoulders. Do not think you have to go through life on your own: I can assure you that you will not, because we will be present every time you need us. I can also assure you that the bar for the person you fall in love with will be incredibly high. They will need to be smart and hard-working and accepting of you and all your personality quirks, because let’s face it: you’re my daughter, you will have some of my own intricacies, and I’ll be glad to point them out to you over the next 40–50 years or so. You are beautiful, so always remain beautiful. No, not in the physical sense: in here, right in your heart, because that will be what draws the people you will never forget. Do not be afraid to dream baby girl. There are still people in this world that will insist on putting glass ceilings over what you dare to accomplish, and I want you to punch your way through them every chance you get. There is not a damn thing in this world that you will not be able to do, there is not a jump too high or a dream too out of reach. You are already special, and the rest of your life is you confirming what we already know. You are smart, remain smart, and don’t ever be the smartest person in the room. If you are, find a different room. You want to be able to know you pushed the best out of yourself. Again, there is not anything you cannot do, and I will remind you as much as you need me to. Sing, dance, play, love, and dream. Everything else will be fine, I promise. Some things will hurt, some things will bother you, but if you see them for whatever they are you will be better for them. Lastly, love yourself. You will have people in this world that try to tell you that you need to lose weight or dress a certain way. You can kindly tell them to leave your life, because they are not good enough to be around you with that mentality. No one that makes you feel like you need to change who you are is a person you need. Do not make friends that you laugh over the good times with: create friendships that you can power through the difficult times with. Difficult conversations are hard, but have them all, because there are lessons in them too. You are, and will always be, my princess, but remember to love and respect your Mom too. She is the Queen of the Castle, and without her there is no you. What she says goes, even if you do not agree with it, and chances are more than likely I agreed with her response. No splitting, it won’t work. We will always have your back, and will love you unconditionally. In every way, we already do. You are our gift to the world, and for that we will cherish you every single day we breathe. Stay you. Remain you. I’ll do my best to be the best dad to you, too.